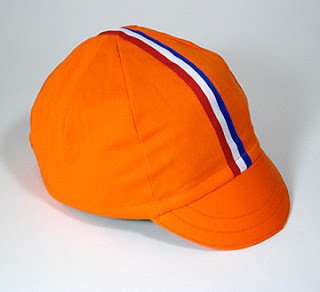 Hans & his new Orangeman cycling cap. 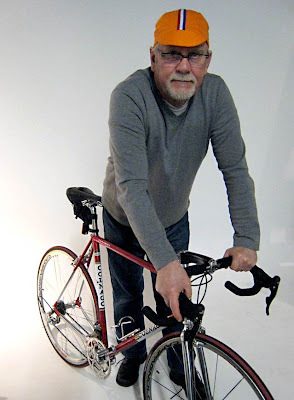 and of course, his Colnago Master X Light! I dropped over last week to see Hans at this studio to deliver his new Galstudio Orangeman cycling cap. Carolle did another great job. Hans wanted a cycling cap to replace his ill fitting Rahpa cap. I told him that we could do a better one. Hans is Dutch and what better way than to make him an orange cap. It's made out of cotton/polyester and we added a nice sporty touch with Dutch stripes. And may I add that it goes well with his Colnago Master X Light! I may have to have one of these. Any plans to do a Belgian one? Come to think of it we're working on one!